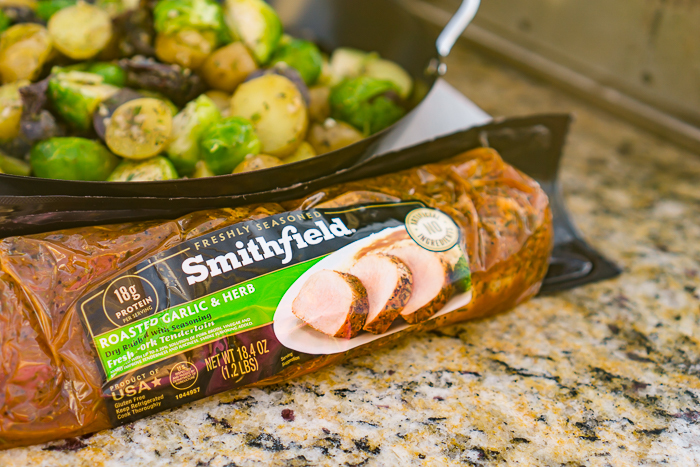 Make this easy dinner on the grill this summer with Smithfield® Marinated Fresh Pork Tenderloin and grilled vegetables! 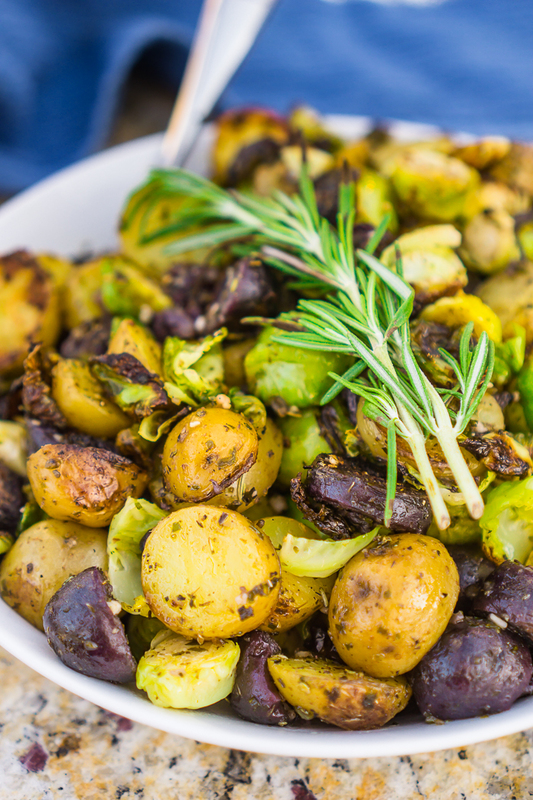 These easy Garlic and Herb Grilled Potatoes and Brussels Sprouts are a new staple in the house and make the perfect companion for grilled pork! I grew up counting down the days until winter was finally done, and Dad would head outside to start grilling dinner again! If I was really lucky, the weather would be mild enough on my birthday in March for a grilled dinner, but I wasn’t usually that lucky living in Chicago. I found it enjoyable to sit around outside with him while he grilled, enjoying the delicious smells and warm summer evenings. But since moving out as an adult, I have yet to own my own grill for these such nights, until now! This will be our first summer owning a grill, and I am so excited to find new grilled dinner ideas for us to share as a family, wanting to take full advantage of the grill as much as possible. When Smithfield asked me to try grilling their fresh marinated pork which I already love roasted in the oven, I jumped at the opportunity. As someone who limits turning the oven on in the summer, we haven’t enjoyed pork year round as much as I would like. Not anymore! While picking up groceries at Jewel-Osco, I picked up a Smithfield Marinated Fresh Roasted Garlic and Herb Fresh Pork Tenderloin. I prefer the ease of dinners that can be entirely cooked on the grill, so I also picked up some potatoes and Brussels sprouts to grill alongside the pork tenderloin. I decided to mirror the flavors of the tenderloin in the vegetables for easy garlic and herb grilled potatoes and Brussels sprouts. The entire meal was flavorful and light, nothing particularly heavy for a warm night. Plus I love the crunch of grilled Brussels sprouts! I took about 20 minutes to prep the vegetables before heading outside to grill, which included removing the core of the Brussels sprouts, cutting the vegetables into 1/2″ slices and boiling the potatoes for 10 minutes in heavily salted water. I was so excited about these grilled potatoes and Brussels sprouts! 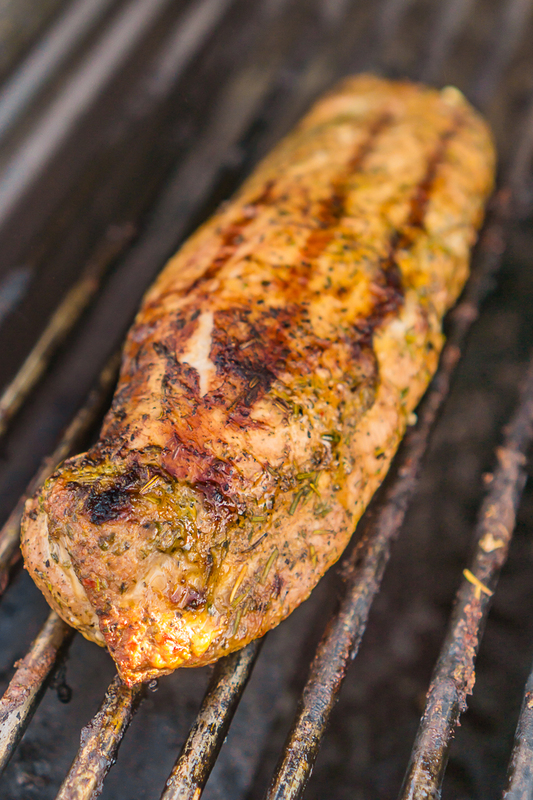 I heated our gas grill to medium (around 350 F) and began cooking the Smithfield Marinated Fresh Pork Tenderloin first following the directions on the back package, which says to cook the tenderloin for 18-30 minutes (until done) on medium heat. Ours took 3o minutes. After about 10 minutes, I added the Brussels sprouts and the potatoes on the grill in a grill pan. You want to make sure not to overload your pan, especially if you like a little crispy goodness! Grill for about 10 to 20 minutes, flipping only a couple times throughout. You don’t want to turn them too often. I took the vegetables and the pork tenderloin off the grill at the same time. The Smithfield Marinated Fresh Roasted Garlic and Herb Pork was fresh, tender and delicious! This was our first time every grilling pork, and we loved it! Smithfield Fresh Pork is definitely making it into our normal summer rotation this year. How could it not with how easy and tasty it was?! With only 20 minute of vegetable prep which could be done at any time during the day and just 30 minutes of grilling, it’s doable for a fun friend dinner on the weekend or an easy family weekday dinner! Heat grill to medium heat (around 350 F). 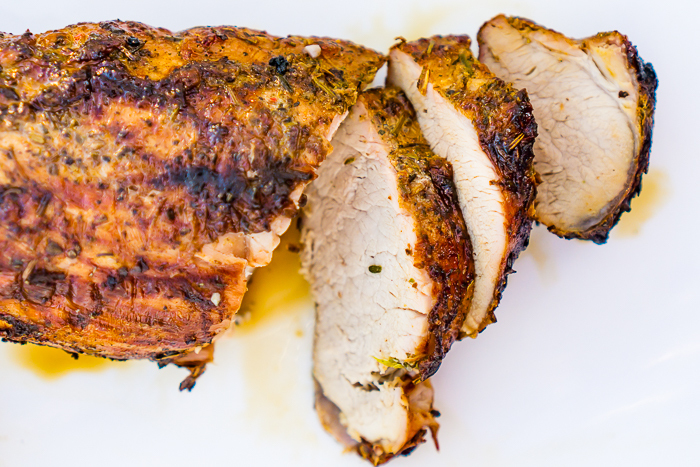 Following the directions on the package, cook the Smithfield Marinated Fresh Pork Tenderloin for 18-30 minutes (until done). Cook to an internal end temperature of 150 degrees F when measured in the thickest part of the meat. If you are looking for even more ideas, make sure to head to Smithfield Grilling website for lots of grill recipes and tips! 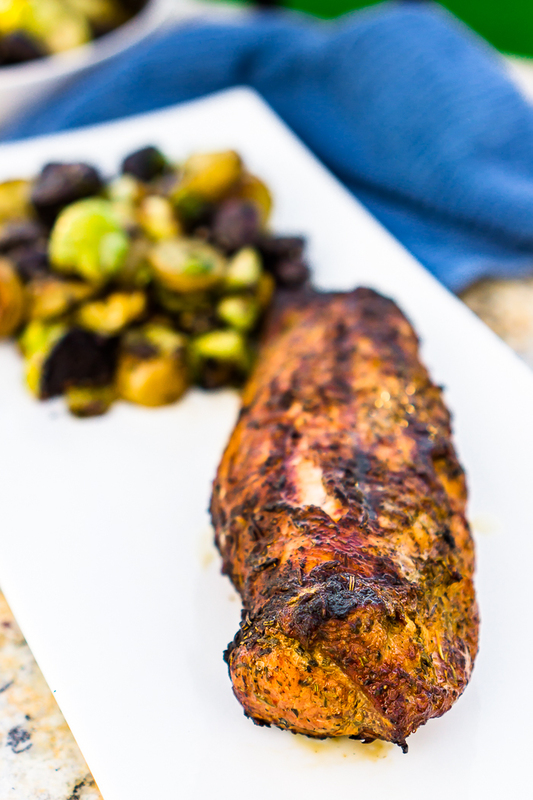 Now, Let’s Cook Some Brussels Sprouts and Potatoes on the Grill with our Marinated Fresh Pork Tenderloin! These easy Garlic and Herb Grilled Potatoes and Brussels Sprouts are a new staple in the house and make the perfect companion for grilled pork! Tossed in oil, garlic and herbs for a light flavor the whole family will love. Perfect side dish on the grill or roasted in the oven! Heavily salt a pot of water fro the potatoes and begin heating. Then slice your potatoes into 1/2" thick slices and carefully add to water. Boil for 10 minutes. Drain when done and set aside. Cut off the core of the Brussels sprouts, removing any yellow outside leaves. Cut in half or quarter for around 1/2" thick pieces. In a medium bowl, combine oil, garlic and chopped herbs. My herbs change a little depending on what I have available, making this really versatile. You will want 1/4 cup of whichever herbs you choose (Italian seasoning, parsley, rosemary, oregano, thyme, and chives are all good choices). Toss potatoes and Brussels sprouts in the oil mixture. 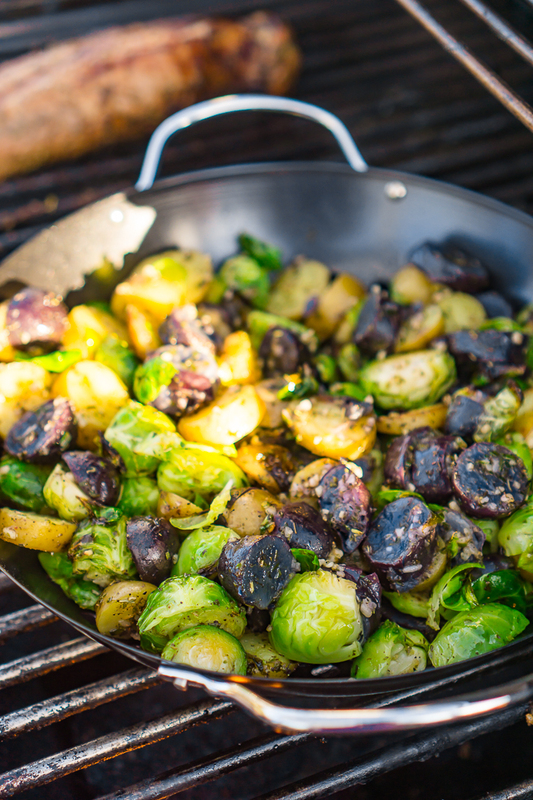 Transfer potatoes and Brussels sprouts to a large grill pan on medium heat. Grill vegetables around 10 to 20 minutes in covered grill, turning a couple times. If you want your vegetables to be crispy from the grill heat, make sure to not overcrowd your pan.